Hi guys I'm heading down the west coast soon , i wouldn't mine checking out the mt magnet mine site i am wondering what is the easiest way to get there have any of you been in there is there any maps available any help would be great thanx. The road in is in good repair and goes all the way down to the old mill site and beyond. You may possibly need a 4x4 to cross the creek down the bottom below the mill. 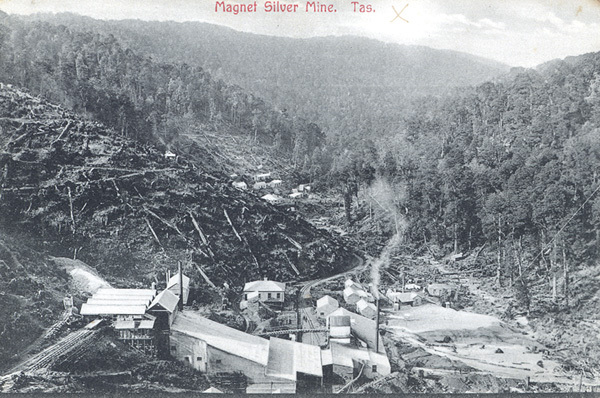 taken from utas: Looking North, Magnet Mine Tasmania. You can see the boiler stack steaming about 65% of the way across the image to the right. and the layout of the mill in this image, its all fallen to bits, but you can still make out the locations of each on the ground. There was a large population that lived in the valley and it suffered some terrible bush fires and was re built twice from memory. may have been once. The turn off is on the right heading towards Savage river about 5km past Waratah. Its at the top of the hill going down into Luina. If you hit the Hazelwood river you need to go back up. The first big Quarry you will see on the left is for road construction. The next one another 2km or so is the Fossicking area. So you can take samples without a licence, but not sell any. some of the upper diggings / scrapings are a bit loose and looked to be about to fall when i was there last, so take a bit of care. Its only a small area and you can scramble to the top pretty easily. For fossicking at the mill. Im pretty sure the machinery is protected, but there are still decent specimens to be found laying around. up the top I came home with a boot full of at least a dozen species of different minerals. The flat area above the mill is the loading area of the mine and associated mine carts used to bring the ore in to there. Ther actual mine is a km of so South of the mill under the Ferro-magnese Gosson area. The boiler pad is the second structure and then stampers and the like. There are lots of images of the old town, that is pretty easy to match to whats left today. the ground and forest are quite open and on the way back up before the fossicking area a road on the right is the old main road, there are adits up and down that road on the right of it and worth a stroll for sure. The fossicking area is a gossan cap and underneath it was the silver (Galena) they mined. Gold, there is a little. But, its main interest (for me at least) is in the shear number of minerals in the area. Smithsonite, Sphalerite, Siderite, Muscovite, Crocoite, Pyromorphite, Native silver, Cerussite Chalchopyrite and Galena. And, many others. Silver, Copper, lead, Zinc, Iron and Magnesium. The Hazelwood is well worth a look for gold if your in the area and some small nuggets have come out from small creeks the opposite side or the road from the old town of Luina.